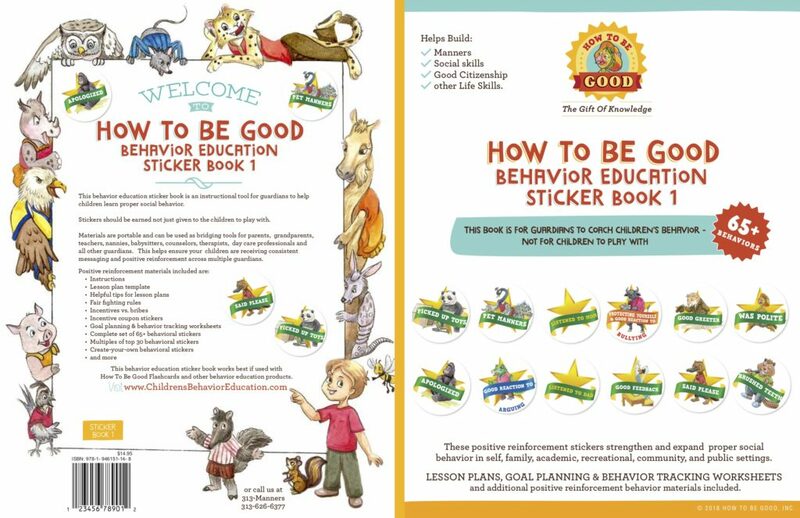 How To Be Good Behavior Education Sticker Book 1 resonates with children while coaching proper social behavior in home, school and community settings. Over 900 stickers provide wonderful incentives for children to accomplish their proper social behavior goals. They are fun to collect and meant to be earned not just given to play with. 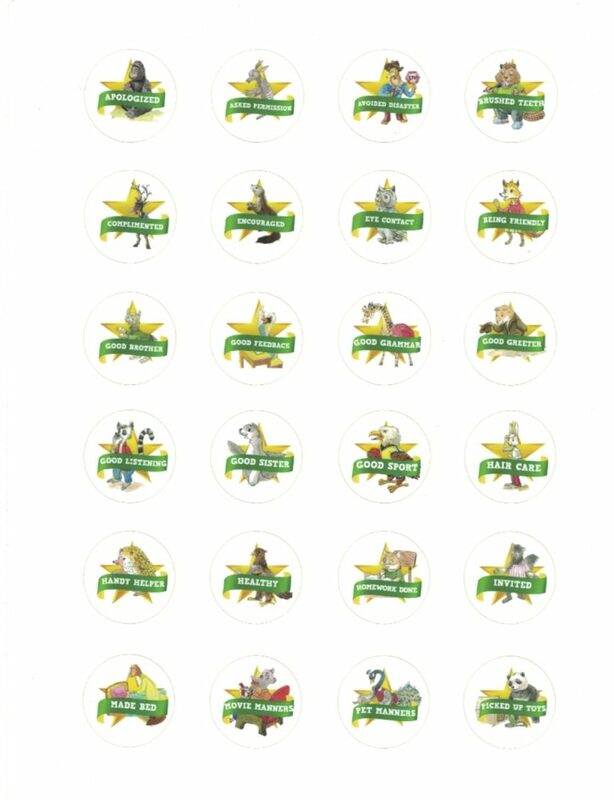 Children love to earn and collect these wonderfully illustrated fun animal behavioral stickers. 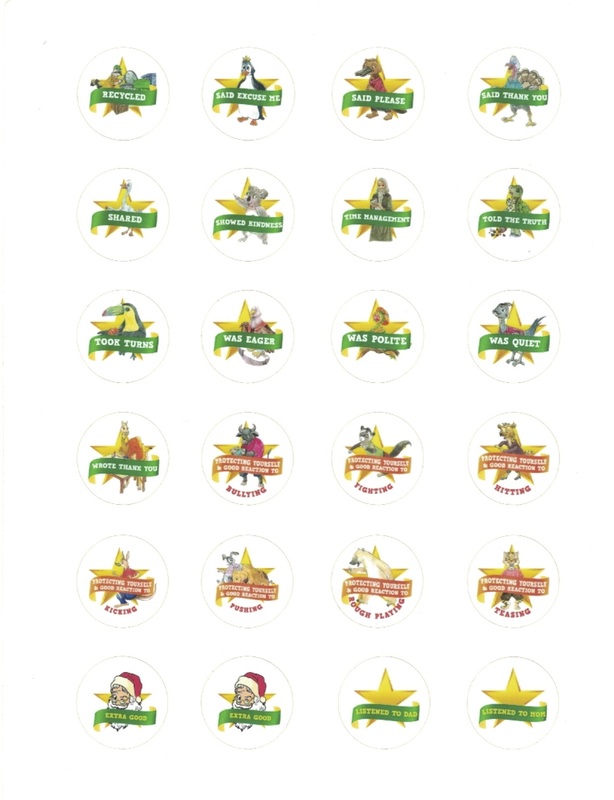 If introduced correctly, these custom gold star reward stickers make coaching positive reinforcement behavior education fun and easy. 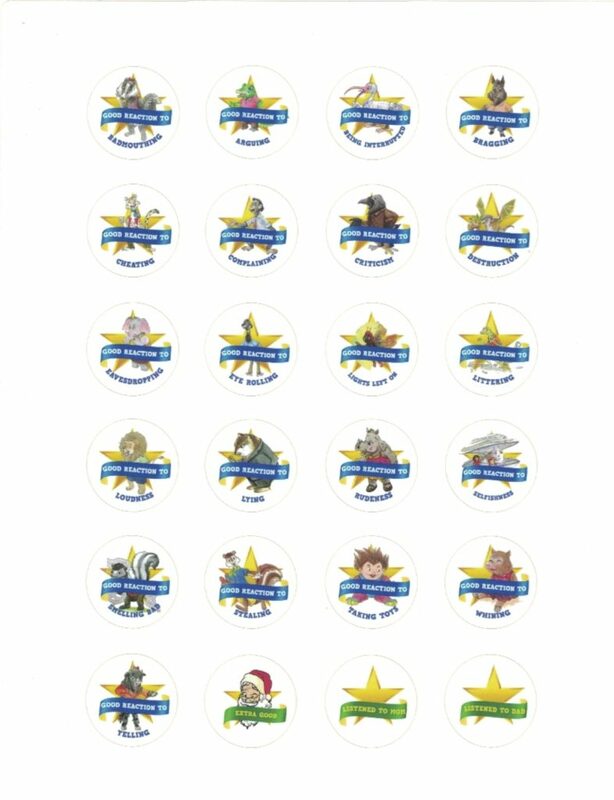 Most children will listen, learn, practice, and use the desired behaviors to earn the stickers. In addition to custom stickers this book provides guardians with helpful tips and tools designed by behavioral therapists and top educators for children. Topics include: listening skills (listening skills page 14), conflict resolution (page 18), understanding Social & Emotional Learning (page 30), group behaviors (page 38), how to be an Upstander (page 40), Addressing cyberbullies, haters and problem provokers (page 46), understanding incentives versus bribes (page 54), easy to use lesson plans and lesson plan templates (pages 34 & 35), and much more! The stickers (and other How To Be Good products) are perfect bridging tools making it easy to provide universal positive reinforcement behavioral guidance. It’s as simple as having any guardian hand the custom stickers to the children when the desired behavior is used. This also helps ensure positive reinforcement is being used (verses the alternatives) when your children are in the care of other guardians! We currently have 65+ characters that coach hundreds of home and school behaviors. 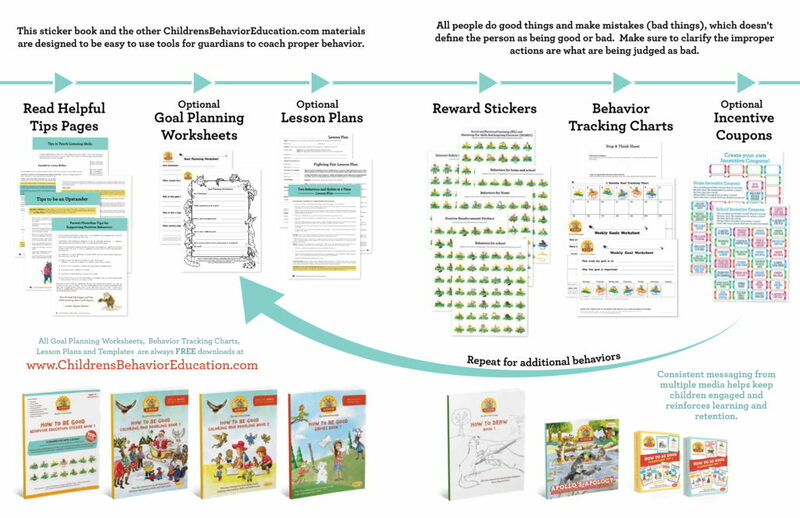 You can purchase this life changing behavior education sticker book by itself or you they come included at 30% off in the How To Be Good with Polly the Parrot or How To Be Good with Santa Kits. There are green, blue, and orange stickers. Blue stickers educate on “Good Reaction To” bad behaviors. We did not want to teach children bad behaviors so we are teaching them how to react good even when others act badly. We provide exact wording and actions to use, and reinforce the message that just because other people act badly is not a reason to act naughty in return. We indirectly teach not to do the bad behaviors. Orange stickers teach what to say and do if you see or experience violent bad behavior. How To Be Good For Santa, Inc. has created the above characters and materials around these behaviors – our mission is to ensure our customers receive the best positive reinforcement behavior education materials in the market. We continually evolve the behaviors materials based on consumer wants/demand. Per our sponsoring crowdsourcing contests that are free to enter, both children and adults are eligible for entry, and valuable prizes will be awarded for ideas used in How To Be Good For Santa, Inc. products! 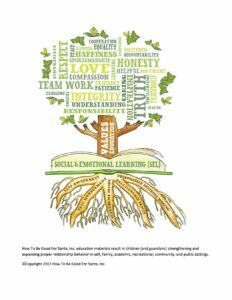 Social & Emotional Learning (SEL), manners, social skills, anti-bullying, conflict resolution, good citizenship, and problem solving behavioral management planning supplies.